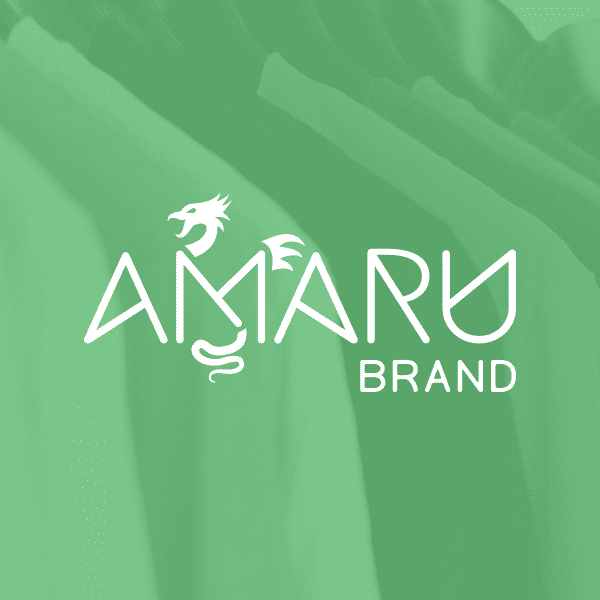 Logo design for new apparel line Amaru Brand. 2017. Amaru Brand is a new clothing company that seeks to take an active role in the immigrant community by providing an apparel line that proudly expresses immigrant heritage while also expressing their love for their new home (the USA). The founders felt that most of the existing offerings were tacky, generic or poor quality, and wanted to create a solution. They also want to help immigrant-related projects by donating a percentage of revenue, and by providing scholarships to immigrants. Both of the founders of the company are from Peru. The amaru is a creature from the folklore of that region, which represents (among other things) transcending boundaries. This seemed a doubly fitting symbol and name for their new venture. In developing their logo I paid homage to that mythology by including a representation of the amaru (a kind of bird-dragon-serpent hybrid). I also created custom typography for the word AMARU, which was inspired by runic writing systems and that same idea of movement over boundaries (hence all of the angled lines). Though both founders are from Latin America, their product line will not be focused solely on immigrants from that area, so we kept the overall styling modern and clean.